Call Us for a Free Appointment! We’ll Check It for Free! The best auto repairs in Turnersville in New Jersey are at AAMCO of Turnersville. Our expert and tenured service technicians utilize the latest technologies while our garages are stocked with diagnostic equipment capable of helping to complete a thorough evaluation of your vehicle. This helps our technicians know exactly what needs to be done and lets you know the exact price and timeline to work with. Because car repairs can be stressful, we strive to make you feel welcome and comfortable while in our auto repair shop. We pride ourselves on creating regulars who prefer taking their vehicles to us when they need repair. By providing honest, complete service to everyone that comes through our door, we enjoy making lasting relationships for locals and travelers alike. You can rest assured that we’ll never try to upsell you on an auto repair that you don’t need or overcharge you for parts and repairs. Volkswagen or Ford? Toyota or Cadillac? Whether you own a foreign or domestic vehicle, AAMCO of Turnersville is the premier destination for all your transmission and auto repair needs. Our vast knowledge of repair services includes both repair and replace of automatic and manual transmissions. We also cover services such as complete brake repair and replacement, differential repairs and overhauls, engine tune-ups and fuel injection cleaning, steering and suspension repairs and much more. If your vehicle is making unusual noises, pulling to one side, or not running smoothly, we offer free inspections. Call us today to schedule an appointment and get your car repaired the AAMCO way. 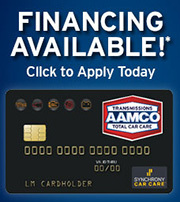 Ask about our special offers and financing upon credit approval options! Everyone we met there was awesome honestly. My husband and I just got our first car and we took it down to them very nervous about what they might find seeing that it is a lightly used car but we are total virgins cars in general. They were very reassuring, very patient with all my questioning and very very knowledgeable. We had one small issue which they fixed free of charge! Amazing experience, I plan to take my car here and nowhere else. I can’t thank you enough for the great work you do for me. You guys are awesome. I’m impressed with the integrity your business displays. If only other business followed suit life would be easier. Can’t thank you enough. Honest auto mechanics! Diagnosed the issues, did what was asked and charged what was agreed upon. Would send my daughter to this place and feel she would be treated fairly. I've had several cars worked on by AAMCO. Each time, they've been honest and upfront with their fees and the work has been completed as agreed. A professional operation and not just transmission work. Great shop. Honest guys, helpful and quick. Replaced the starter on my van the same day I called and checked my transmission for me. These guys are great. Very friendly and helpful. They are not condescending and they don't fear-monger or try to intimidate you into getting unnecessary repairs done. Love this place. My ancient Geo Tracker kicked the bucket, and AGAIN they were able to resurrect it from the dead! Thank you again! Great service and great staff! Will definitely recommend! Very courteous and friendly! Really took the time to look into my car's problems, and gave me great solutions on how to fix my car's transmission! Believe it or not, Aamco does more than trans repairs. They also do engines. They replaced the engine on my Focus, and got me back on the road. Love them!